New for DEF CON 23 we are adding a place for you to show off your tools, projects, and tech to attendees - much like a poster board session but with computers. 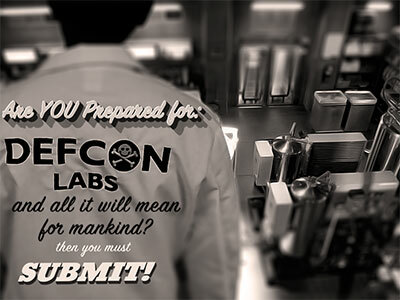 The DEF CON Demo Lab is a dedicated area for hackers to show off what they have been working on, to answer questions, and even convert attendees into trying of giving feedback on their projects. Presenters will be given a dedicated time and location to present a tool or project of their creation; show what it does, how it works, and why we should add it to our own hacker armory. Please Note: Your tool or hardware must be open source. This is about you sharing what you’ve created with the community and getting them excited about using it / contributing to it. There is a vendor area for those looking to pitch something. A space in the DEF CON Demo Lab, a table with power and an easel for you to put a poster board on, along with a dedicated time frame (2-4hrs) to show off your stuff. This will give you exposure to over 15,000 hackers on site, and exposure to countless individuals through the DEF CON website and twitter feed. You’ll be showing off your project to a highly technical audience which will drive conversation, innovation, and maybe even confrontation, we can’t be certain, we’ll leave that to you. So get your submissions in now and we’ll pick the most promising folks to face the masses in August. Good Luck, and we’ll see you at DEF CON! Interested? Email to demolab [at] defcon ]dot[ org and we will respond with any questions we may have. Selections will be made by June 1st, if not sooner.